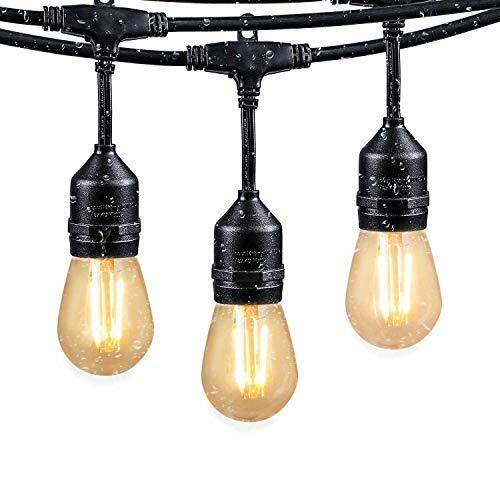 Brightown 48Ft Commercial Grade LED Outdoor String Lights with E26 Hanging Sockets, 2 watt Dimmable S14 Bulbs Weatherproof Connectable Strings for Patio Deck Backyard Bistro Cafe Market Pergola Garden Wedding Party Decor. Made of high quality material. Free of toxic chemicals (mercury or lead), and will protect your family's health. Save energy, protect environment. COMMERCIAL QUALITY AND SHATTERPROOF IMPACT RESISTANT LIGHG BULBS - These 48 foot weatherproof lights are designed with shatterproof plastic light bulbs to withstand the wear and tear of year-round outdoor use. Built with durable WeatherTite technology so they can withstand extreme temperatures, rainy, windy, or damp climates. EASY INSTALLATION: Standard S14 shape with E26 Medium Base Sockets. Use cup hooks, guide wires, or zip ties (not included) with the built-in loops to hang perfectly. It takes only a few minutes to complete the installation.